This is Pastor Nickolas Wafula. He left his home at 4:00 am this morning and rode 6 hours here to the mission house to pick up the bibles for the churches he oversees. He visited with me about 30 minutes and then he was off back toward home for another 6 hour ride. He didn’t stay long because he didn’t want the bibles to get wet and he knew the rains would surely come as they do every day now. Before he arrived, I had been feeling badly with the Malaria and having a pity party. Then, Pastor Nickolas rides 6 hours on an old bicycle on a dirt road to come for a 30 minute stay, then another 6 hours back down that same dirt road home. 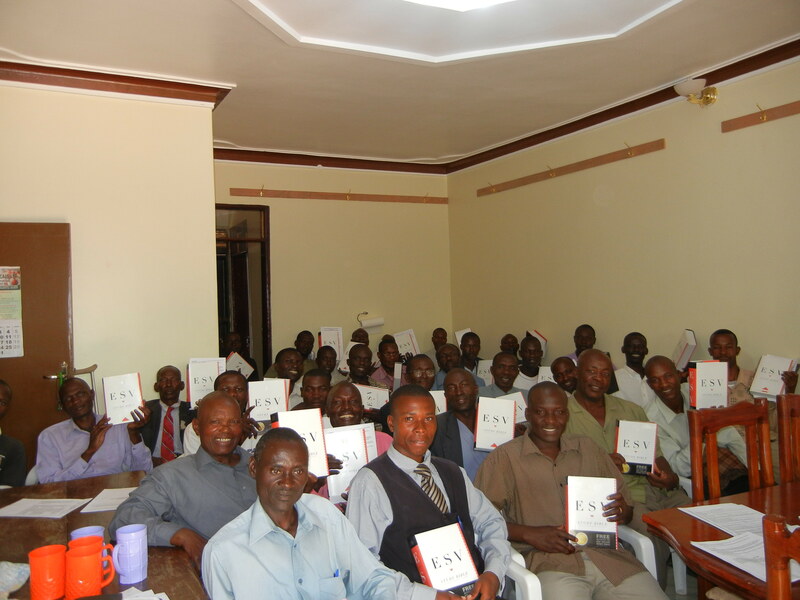 Needless to say, I quit complaining about having Malaria…..I had been truly blessed by this Pastor’s desire for his pastors to have a copy of Gods Word. I’m still not up to speed with this round of Malaria…still running a fever today. Hoping this is the last rough day….am ready to get it behind me. I came here this year on medicine to keep me from getting Malaria and still God saw a reason I still needed to get it again. Pastor Moses told me yesterday that so many children will die in the next few weeks as this rainy season is the worst time for the mosquito’s who carry the malaria parasite. 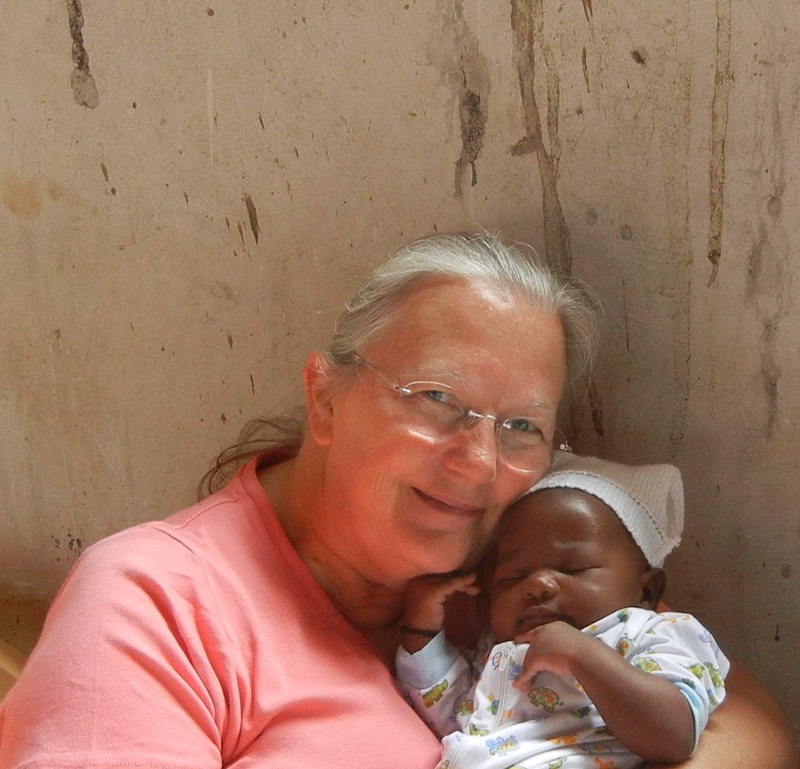 Having malaria again has brought the illness to the front of my mind and now I will be more aware of the little children who need me to help them get the medicine where they won’t die. Would you please pray that God will send me word of those who will need help. It is a devastating feeling to hear of a child who has died and I didn’t know they needed help. these are some happy…happy men of God. I should be all better by Saturday….and am looking forward to our first class beginning. The youngest pastor is 26 and the oldest pastor is 95. Pastor Michael who is 95 years old walked here on Saturday to register. Wow… what an encouragement to know this 95 year old man of God is starting bible college classes. I know I will have lots of stories to share about him as our classes begin. Please pray for these pastors….they have such a deep desire to know more of Gods Word. How blessed we are to have been given these courses for our pastors. Please pray for me as I facilitate the DVD lectures for the classes. Pray that I will be a good encourager for them. This is one of my guards…Geoffrey. Yesterday, while he was off duty, he brought his boys over to visit me and cheer me up. Geoffrey’s wife drown just a few months ago in Lake Victoria. She and their smallest child, who was just a couple of months old were in a boat with 8 other people. The boat turned over and she could not be rescued. Little Rafael here was pulled to safety, but the Momma drowned. Geoffrey was home with their oldest boy Dominic when the news came that she had perished. 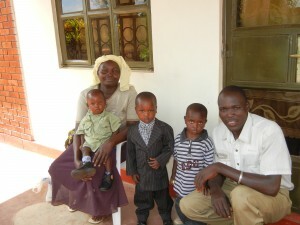 This is Geoffrey’s Momma in the picture with them….she is helping him raise his sons. The middle sized boy belongs to Geoffrey’s younger brother who was hit by a car and is now unable to walk. So, Geoffrey and his Momma are raising his son. Stories such as these are so common here….yet, when you have the opportunity to grow close to a family that such tragedy’s happen to, it just breaks your heart. Geoffrey is by far the best guard I’ve had…sometimes I’m a little overwhelmed at his protective nature of me….but then I realize he takes his responsibility of protecting me and our teams who visit very serious. Please join me and Geoffrey’s Momma as we are praying for God to send Geoffrey a new wife who will first and foremost love the Lord, and also love his boys. 27 years old with two toddlers to raise is a hard task, so we are trusting God to send the one He knows they need. Thank you for all the prayers and sweet words of encouragement you’ve sent my way. I’d ask you continue to pray for my unspoken request…its a request dear to my heart and very important to me. So happy to report….the rainy season has begun. The 100 degree weather is behind us for a while and for that I am very thankful. No matter where you travel, you see workers in the fields getting their seeds planted. The drought here has caused many families to be without any source of food. Many of our children at the orphan school have been sharing about not having any food at all to eat. I am always most thankful for the food provisions Helping Hands provides to our children, but at a time like this it becomes an even greater blessing as I know without this food, many would go without completely. Its been a busy couple of weeks with teams in an out. Its always a joy to have short term teams come to serve. One thing I throughly enjoy is watching the orphans receive packages from their sponsors that these teams deliver. Steve Moon enjoyed spending time with Hassan…the boy he sponsors. The children are always happy to received a package from their sponsor….but to have the sponsor come and visit makes them happiest of all. This little boy named John is the child my son Bryan and his family sponsor. John is such a sweetie…he comes running when he sees me which makes my heart happy! Please pray for our little John as he was diagnosed with HIV just a few months back. To see him and hear him laugh and watch him play you would never know the war raging within his little body. When I first came to the mission field here in Africa, I was told that in time there would be some little girls born who would be given the name Joy. I’d like to introduce the first Joy to arrive….. I am so honored that my name would be shared. I can’t help but think of my parents and the story behind my name. Being born to them when they were in their mid-forties they made a choice to embraced parenthood in mid-life. I was always told that I am called Joy because they couldn’t think of anything else I could be as God had given me to them at that season of their life. Now, to know that their name for me is living on…53 years later in a little village in Africa…….even though they’ve been in heaven for more than half my life now, I can’t help but wish they were here so I could tell them. 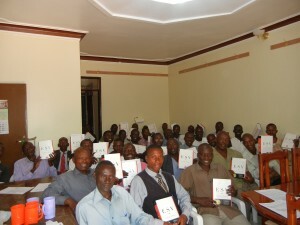 Blessings are continuing as each team arrives with the study bibles we’ve been anxiously waiting for. This is one of those things that I am very thankful to be able to witness. A study bible for a pastor is something they never thought they would have. Almost half of the 230 study bibles purchased have been transported here from Georgia and are being delivered to the pastors. 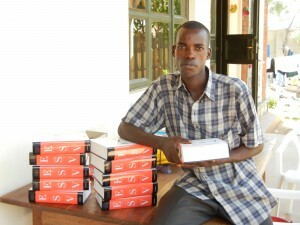 The remaining bibles will be sent along with the next short term teams. My sincere thanks once again to Craig and Christin Haynie and Trevor Cain and Brad Faulkner for putting these study bibles into the hands of our pastors. I don’t believe it will be possible to account here on earth for the lives changed with these bibles. Only when we reach our heavenly home will know the impact that was made. 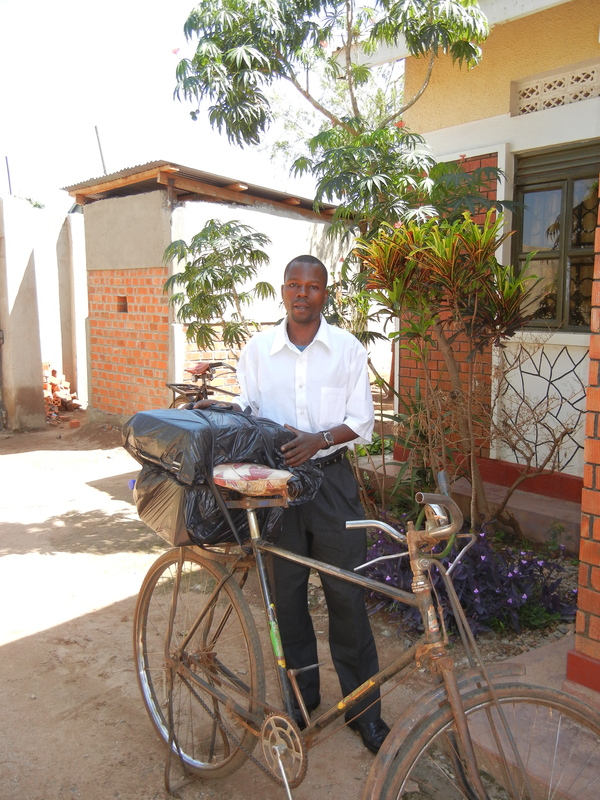 All is well here at the mission house, I’ve been released to travel by myself to and from school or town as long as I take a bicycle taxi. I still cannot walk anywhere by myself, but am happy to be able to leave the compound. Everything seems back to normal and for that I am very grateful. I have two team members still here with me until mid April. One of them is from Bolivia, South America and speaks very little English. We are having a great time learning from each other….during supper each night we are teaching each other our languages. Of course I had to share that the English he is learning from me will not work well in most other parts of the world! As it has been since I first arrived in Africa….my southern accent is not easily understood. Wilzon (from Boliva) and George (also a southerner) are here doing construction. Today we are headed to the capital city – Kampala where we hope to be able to purchase a cement mixer. We know it will not be an easy task, but we are hoping for the best! What do you get when you combine four American women whose ages averaged together is fifty four?????? An awesome mission team! Together…Dr Brenda, Pam, Duck Ae and myself joined 2 Kenyans and 4 Ugandans and watched God work all around us in the hill country of Kenya. 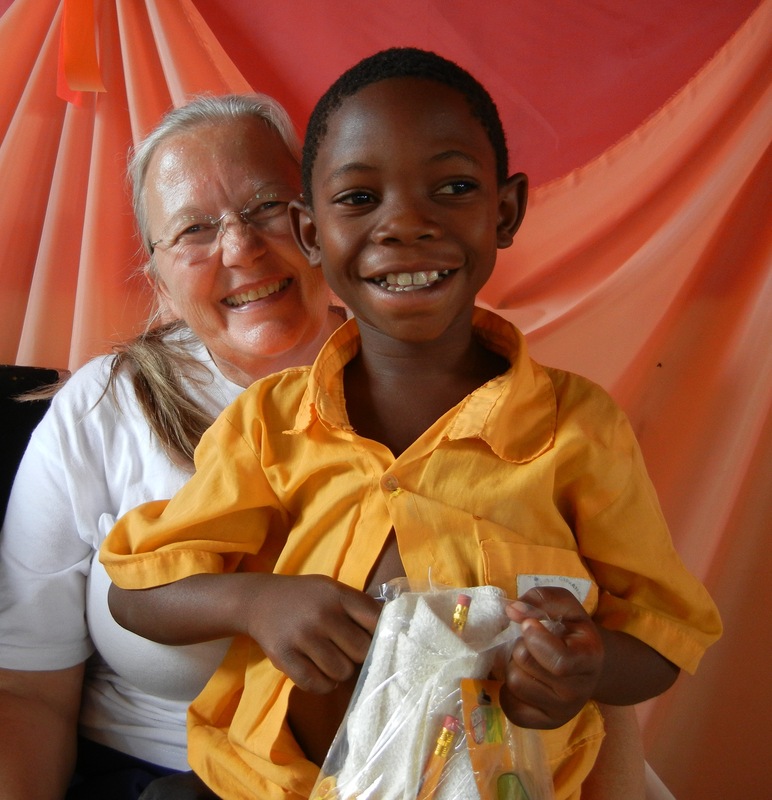 Overall Dr Brenda and the nurses were able to see over 150 children and 70 adults. Duck Ae, myself and our evangelism team had the opportunity to share the gospel and watched as God had a great harvest of more than 50. Most of you remember a few months back I told you the story of Eric… a deaf boy who together we are helping to go to school. God has wonderful timing. As we were making our journey towards the hill country where we served, we passed right by the entrance to Eric’s school. His school was not 15 minutes from our motel! 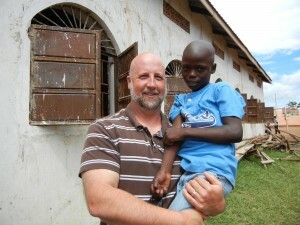 The morning I left to head back to Uganda, I got to stop and visit with him. The Kenya school for the deaf and blind is an amazing facility. They serve 65 boys and young men who are either deaf, blind or both. They participate in raising crops, raising chickens, pigs, cows and ducks. They learn every aspect of agriculture, from making compost to harvesting the crops. It’s a 3 year program and when Eric graduates, he will be able to do all of the above. The principle told me they cannot keep up the demand for job placement inquiries that come to the school. He told me these students are hired out before they graduate. Walking in and seeing Eric’s surprised look was great. But the greatest thing of all was when I watched him use sign language and communicate with the principle. The principle asked him who I was and Eric signed that I was his sponsor. Then the principle asked him what my name was and Eric didn’t know. You see, before Eric went to this school he didn’t know how to communicate, so all he knew was that I was his sponsor. So, the principle signed my name and Eric smiled and signed my name! For the first time Eric now knows my name! How blessed am I to get to see such a wonder! It was a great ending to the weeks of teaching and traveling for me as I left and headed back to Uganda and a great beginning for Dr Brenda and her team as they journeyed on to Tanzania and The Congo. Sunday night I was listening to the podcast sermon from my daughters church. Pastor Richard Sego was talking about what it is going to be like when the rapture happens. He was talking about if a Christian here on earth is blind, that when the rapture happens the first thing they will visibly see is Jesus coming in all His glory. Well, that got me to thinking about my grandson Stephen and also Eric….the first thing their ears will ever hear naturally is the shout…followed by the voice of an arch angel…followed by trumpet blast! Now I gotta tell ya….I was covered in glory bumps as I realized what a special time this will be for Stephen, Eric and all the other of God’s special children that He chose to allow deafness here on this earth. And then I thought about those I met at the school who are blind….those who have never seen any image in their lifetimes….in the moment and the twinkling of an eye….their going to see the face of Jesus. It is good to be back here to the mission house in Uganda. Well, let me rephrase…it is good….except the heat! 102 degrees….96 in the shade…its just plain hot! It seems all is quiet and no evidence of violence from the recent elections. I’m still limited in where I can go alone, but hopefully that will all go back to normal soon. I especially miss being able to walk through the villages on my way to the orphan school. Thats a highlight of every day here. The armed guard that I wrote about last year moved while I was away, so now I have a new guard. But the other guards who rotated in and out are still here protecting me…so all is well. I’m looking forward to serving with the teams coming in from the states from now until mid-April. Then, I have another conference in Kenya and two in Uganda before I head home for a visit in May. Looking forward to God continuing to do great and mighty things! The Life and Mission of Joy Breedlove is powered by	WordPress 3.4.2 and delivered to you in 0.178 seconds using 40 queries.